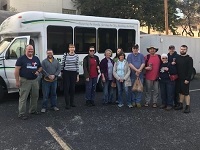 In January, our pastor and two GPC members went with a small team from the Presbyterian Project to Oklahoma City. The Oklahoma City suburbs experienced tremendous loss of life and property from tornadoes that swept through the area in May 2013. EF4 and EF5 tornadoes swept a mile-wide path that extended for 17 miles. The team worked with an organization called Samaritan’s Purse to renovate a home damaged by the storms. In January, two mission teams with members from GPC, Elfinwild, Parkwood, and Fox Chapel Presbyterian churches went to Staten Island, which had been ravaged by Hurricane Sandy in late 2012. They stayed at Elim Christian Assembly Church and worked to repair homes that were heavily damaged by the storm. 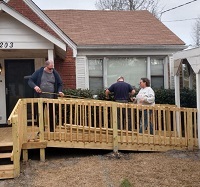 Our pastor and nine GPC members worked with members of Shadyside Presbyterian Church, the First Presbyterian Church of Burlington, IA, and Sewickley Presbyterian Church to repair and renovate houses in the area surrounding Mars Hill, North Carolina.